The threat of rain lingered, but didn’t stop hundreds of thousands of fans from getting to Lambeau Field on August 4 for their first glance at this year’s team. 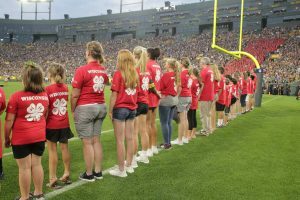 Among the sellout crowd were nearly 1,000 Wisconsin 4-H members, volunteers, family members and staff filling the stands of Section 127, invited by the Packers as their official community guests. Forty lucky 4-H’ers lined either side of the tunnel to form the Packers Ambassador Line as fan favorites like Aaron Rodgers, Davante Adams, Randall Cobb, Ha Ha Clinton-Dix and Clay Matthews took the field. The family-focused, game-like atmosphere featured activities like on-field football drills, dance performances and youth football scrimmages before the practice. The unique Packers tradition highlights the strong connection between the team and its fans, bringing them the closest to a game day experience as possible. “We’ve heard from many people who have said without this opportunity, their family would have never made it to a Packers game,” said Melinda Pollen, Brown County youth development educator. Each year, the Packers donate a group of tickets to a non-profit organization selected by their Community Outreach Department to invite to Family Night. Various groups are nominated both externally and internally for their work in our community. Shortly after Pollen was initially contacted by the Packers, a 10-person planning committee of educators assembled from across the state to plan and implement the event. With a total of 1,000 free tickets to distribute, the group developed a creative solution: a statewide lottery. All currently enrolled 4-H members and leaders received an email inviting them to enter the lottery and be part of the Wisconsin 4-H delegation at Family Night. Youth members were required to be accompanied by a parent or guardian, while leaders could opt to bring any guest along with. 4-H Youth Development staff from around the state were also given the opportunity to enter a staff lottery. Winning entrants were randomly selected, but reviewed at the statewide level to ensure there were 4-H representatives from every county and all types of youth development program delivery models were included, like community clubs, afterschool programs and SPIN clubs. Local Brown County resident and Clover Bud project leader Sarah Vercauteren attended the game with her youngest son, Branden, who was the lucky winner. Sarah and her husband, both 4-H graduates, recently finished their fifth year of 4-H involvement with their 3 sons. 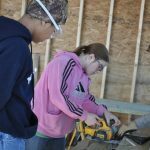 “It was a great way for 4-H kids to meet others from around the state,” she said. “There was a younger girl sitting next to us talking about her upcoming fair the following week, so we started asking what the other was bringing. It was interesting learning about other counties’ fairs and projects.” The pair enjoyed their one-on-one time together watching the acrobatic performers, spotting their group on the Jumbotron, and ended the night with a laser show and fireworks. The sea of hundreds of red commemorative shirts was hard to miss amongst the crowd of 64,702 people. When they weren’t participating in the stadium wave, they were either trying to start it or continue it. Their strong presence in the crowd not only helped promote the 4-H program, but the opportunity to thank the volunteers who make it possible. As the nation’s largest youth development and empowerment organization, Wisconsin 4-H thrives thanks to the outstanding volunteers who are dedicated to fostering the upstanding leaders of today and tomorrow by strengthening their ability to make positive contributions to their communities. 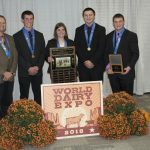 “It was an amazing opportunity to be able to partner with the Packers, who, just like 4-H, want to give back to Wisconsin’s communities,” said Pollen. The recognition portion of the event is part of the team’s Packers Give Back campaign, the team’s all-encompassing community outreach initiative. The two organizations share a crucial component of stewardship: a commitment to bettering communities through volunteerism, and have established a long history of working together to give back. Recent collaborative efforts between the Packers and UW-Extension include Planting for a Purpose, Veterans’ Gardens and various community gardens across Brown County. “You could see the pride in 4-H from each member I encountered. I’ve never had a group ask if they could pick up garbage in their section following the event,” said Wery. The night concluded with a laser show and fireworks just before a downpour of rain hit the Green Bay area. “It really was a magical day!” added Pollen.